The Faculty will hold the fourth York Forum on April 3 at 7pm (Cybersecurity in the Age of Espionage) with cybersecurity expert and former FBI operative Eric O’Neill. Science Communicator in Residence Dan Falk will moderate. Panellists are Patrick Ingram (Math & Stats) and Osgoode Adjunct Prof. Kristin Ali, Associate at Osler, Hoskin & Harcourt LLP. Tickets are free, register here. 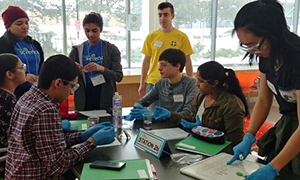 About 60 Grade 11 students from six schools across Toronto and York Region participated in the third-annual Tri-Sci Tourney on Feb. 21 at the Life Sciences Building, hosted by the Faculty of Science and Bethune College. The winning team was from Markville Secondary School, which entered two teams. The other team took third spot, while St. Augustine Catholic High School’s team came second. 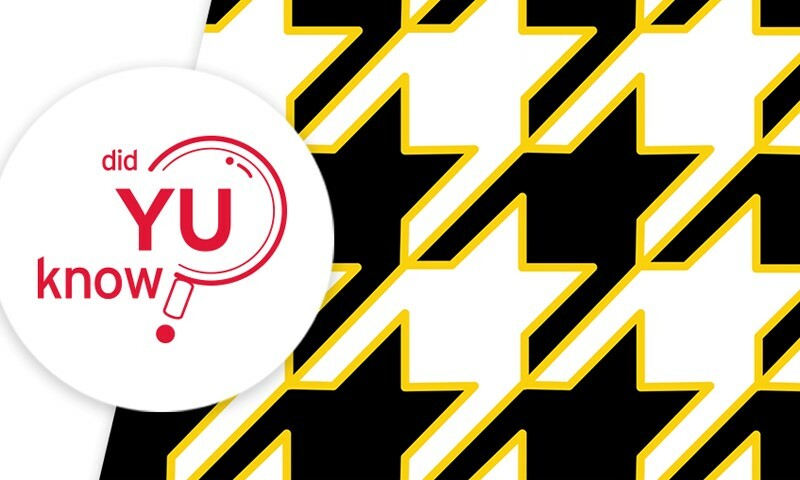 The latest Did YU Know video with Amenda Chow (Math & Stats) shows how art can be created using math. There’s more to that hounds-tooth pattern then you think. Jennifer Chen (Biology) received the 2019 Fred Beamish Award from the Canadian Society for Chemistry. The paper, Eliminating Symmetry Problems in Electronegativity Equalization and Correcting Self-Interaction Errors in Conceptual DFT, in the Journal of Computational Chemistry by László von Szentpály is dedicated to Huw Owen Pritchard (Chemistry) and is available through the Steacie Library. Meet the newest York Science Fellows joining the Faculty this year with their supervisors: Mohammad Naderi (Biology) with Raymond Kwong, Meera Mehra (Chemistry) with Chris Caputo, Hanmeng Zhan (Math & Stats) with Ada Chan, Leo Yvonne Alcorn (Physics & Astronomy) with Adam Muzzin and Marianna Bleker de Oliveira (Chemistry) with Sergey Krylov. Hongmei Zhu (Math & Stats) and her group held the first two-day math workshop for teachers, jointly organized by Math for Real, a non-profit organization to promote high school math modeling education, and Callysto, a not-for-profit organization to promote programming literacy to K-Grade 12. The event took place Feb. 21 at York Life Sciences Building and introduced teachers to the Callysto platform, modelling and programing, and showed them how to prepare students for the upcoming Canadian competition at the International Mathematical Modeling Challenges. Amro Zayed (Biology), and his former PhD student Brock Harpur, sequenced the genomes of three honeybee populations; two of them bred to express highly hygienic behaviour and a third population with typical hygiene. They found the key to breeding disease-resistant honeybees could lie in a group of genes known for controlling hygienic behaviour that enable colonies to limit the spread of harmful mites and bacteria. Their results are published in the journal Genome Biology and Evolution. Amro Zayed’s paper, Integrative Genomics Reveals the Genetics and Evolution of the Honey Bee’s Social Immune System, was picked up by various media outlets, including CBC Radio’s Quirks & Quarks. Sergey Krylov’s (Chemistry) paper, Ideal-Filter Capillary Electrophoresis (IFCE) Facilitates the One-Step Selection of Aptamers, was written about in the blog In the Pipeline by respected industrial chemist Derek Lowe. Paul Delaney (Physics & Astronomy) was on Global TV talking about Asteroid NT7 and near Earth asteroids, AM640 Morning Show discussing the Cuba meteor event, and Sirius XM and AM640 Morning Show talking about the loss of Opportunity and its history. He also did a presentation to Saddlebrooke Skygazers (in Tucson) about New Horizons’ continuing mission. 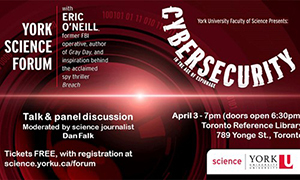 April 3: York Forum: Cybersecurity in the Age of Espionage starts at 7pm (doors open at 6:30pm) at the Bram & Bluma Appel Salon, Toronto Reference Library, 789 Yonge St. Tickets are free, but register at bit.ly/2BRFA64.